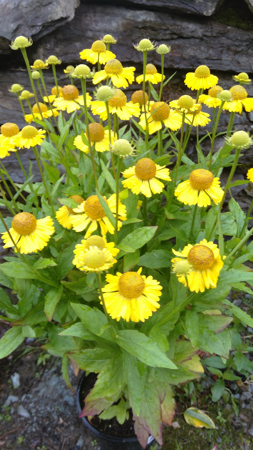 This is one of my choice selections for late summer/autumn pollinators, Helenium 'Sombrero'. I am currently developing a border for pollinators, bees, butterflies etc, they need all the help they can get. Last year was a particularly poor year for butterflies, and I feel that wildlife gardening should certainly be more in the forefront of the gardener's thinking strategy for planting. Already, after being planted for just two weeks, a regular visitor to Helenium 'Sombrero' has been the Tortoishell butterfly, not to mention the bees happily buzzing around the yellow flower cones on the warm sunny days. I plan to grow them on in this border for next season, with a view to dividing small sections of each plant for replanting for Autumn in 2018. 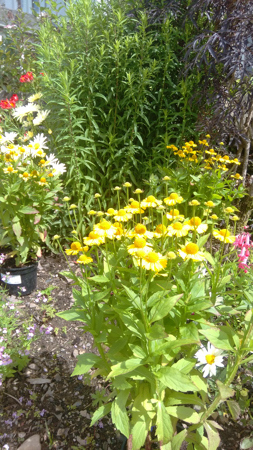 2 Comments To "Helenium 'Sombrero'"